The following guest post was submitted by Union Quay Medical Centre. Did you know that approximately 5% of the world’s population suffers from diabetes? This equates to 347 million, which is more than the populations of every country in the world except China and India. In an even more alarming development, the World Health Organization expects that the total number of deaths from diabetes will more than double within the next 10 years. Union Quay Medical Centre in Ireland created this eye-opening infographic about the effects of diabetes. It demystifies a number of common misconceptions about diabetes, outlines symptoms and causes, and also offers helpful advice on how to tackle Type 2 diabetes, which affects 90%-95% of all diabetes sufferers and can be prevented with a series of lifestyle changes. You may have heard in some quarters that women with diabetes should not get pregnant, or that gestational diabetes will disappear after a woman gives birth. In truth, women who manage diabetes effectively can have a normal childbirth, but gestational diabetes is unfortunately more likely to occur for both mother and child. Other myths that this infographic hopes to debunk is that people can get off lightly with ‘a little bit’ of diabetes, and that diabetes sufferers cannot donate blood. They can give blood if the diabetes is controlled. As for having ‘a little bit’ of diabetes, this is a total lie. Anyone with the condition stands a high chance of developing further complications. Read through the infographic below to discover more surprising facts about diabetes, a condition that has sadly become a global epidemic. As in any profession, nurses can only perform as well as their workplaces, teams, and managers allow. While all healthcare employees are responsible for an organization’s performances, nurses are in an important position to directly influence patients’ experiences and outcomes. But in healthcare, performance doesn’t just have consequences in patient satisfaction; it can also affect recording errors, medication errors, and ultimately patient mortality rates. Since managers are in a position to directly control the environment in which nurses work, their leadership style can have a tremendous impact on how patients are cared for and how the organization performs as a whole. Research has found that there are distinct correlations in how each of five key leadership styles can positively — or negatively — sway the quality of care provided. Leadership styles can be fluid, and there isn’t necessarily one correct approach which will suit every organization or situation. For example, transactional and authoritarian leaders can excel during emergency situations, whereas democratic leadership is at its best when collaborating to refine processes and workflows. Transformational leadership can inspire nurses to perform at their best, demonstrated by research indicating reduced patient mortality in three of six studies. 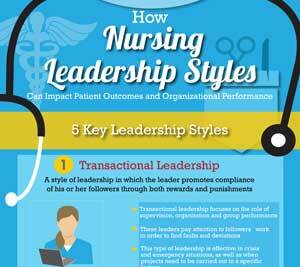 Learn more about these leadership styles with the infographic below, produced for Bradley University’s Online Nursing Program. This graphic gathers research examining the link between different management styles and how they can influence an organization’s performance and patient outcomes. The global healthcare industry is riding the crest of a wave of major technological revolution, with the industry standing to gain billions of dollars from the dawn of virtual home visits and apps that can diagnose your illness. To give you an idea of just how big an impact this technology-led future may have, research shows that replacing ambulatory visits with virtual healthcare can save 37,000 American physicians an average of five minutes per encounter, resulting in time savings to the value of more than $6.5 billion. Home Healthcare Adaptations, an Irish-based provider of household adaptations for people with limited mobility, has created this infographic which explores the brave new future that awaits the healthcare industry. Thanks to technological advances such as hologram house calls, which involve a doctor ‘visiting’ a patient in their home in hologram form, healthcare operations can be carried out far more rapidly. With patients receiving quicker treatment, the demands on doctors and nurses are eased, allowing them to better tend to the needs of patients, which in turn leads to patients being more likely to receive the help they need. It’s a cyclical process where everybody wins. However, there are some obstacles that need to be overcome before virtual healthcare truly takes a vice-like hold on the industry. Any doctors providing telemedicine services will need to receive, or quality for, licensing, while the need for new reimbursement channels will require the use of financial and human resources in streamlining the smooth operation of this technology. These obstacles pale in comparison, though, to the potential game-changing benefits that are on offer. Virtual healthcare may still seem like a fantasy for now, but it won’t be that way for much longer. The following guest post and Hospital Acquired Infection Infographic was submitted by David Smith from UK based Cleaning Services Group. Hospitals and healthcare facilities are intended to improve our health and, for the most part, they fulfil that function. However, some of these can pose unwanted health risks to patients in the form of hospital acquired infections (HAIs), namely those diseases such as pneumonia which can be contracted in healthcare settings if medical professionals fail to take the necessary care with patients. The below infographic from Cleaning Services Group identifies the most common HAIs, outlining what they are, how they can be contracted and, crucially, what can be done to prevent these infections. Pneumonia and surgical site infections account for more than 43% of HAIs between them, a staggering figure which may shock and worry you. The risks of contracting a HAI can vary depending on the physical condition of the patient and the nature of the healthcare facility. An elderly patient undergoing a long-term stay in a hospital with substandard hand hygiene practices is at far greater risk than a robust young adult staying at a hospital where safety standards are consistently met. Learn more about HAIs and what you can do to minimize the risk of you or a loved one becoming infected.